Submitted Photo Members of the Board of Trustees for the United Way of Northern Chautauqua County are pictured here. Front row, left to right are: Lucas Catalano, Paula Pichon, Beth Margolis, Rebecca Hamlet-Kapple, Jennifer Wilkins, Traci Avila. In the back row are; Michael Borrello, John Noel, Tyler Gotowka, and Kyle Leikam. Missing from the photo are; Brad Balentine, Kim Wilkinson, Alicia Ekstrom, Gary Sobilo and Jonelle Frazier. At the heart of any effective community organization, is a group of caring, and selfless leaders that show genuine care and concern for their community and those around them. The United Way of Northern Chautauqua County has been able to develop a Board of Trustees that exhibit those traits and add so much more in their quest to help our community Live United. At the recent annual meeting that group elected their leadership team for the year ahead. The office of the President of the Board was vacated by Kyle Leikam, who had served in that capacity for two years. His leadership saw the highest grossing golf tournament on record for United Way, a change in the organization’s Executive Director, and continued funding to community partners, despite economic challenges across our region. Moving into the President’s role will be Rebecca Hamlet-Kapple, an avid and energetic champion for our region and community. She stated, “The United Way Board is prepared for the challenges and opportunities that 2019 will present, as we continue to make an impact in the Education, Financial stability and Health of Northern Chautauqua County, through our support of our partner programs, educational initiatives and community outreach.” Hamlet-Kapple has served on the United Way board since 2016, most recently serving as Board Vice President and chairing the Nominations Committee. 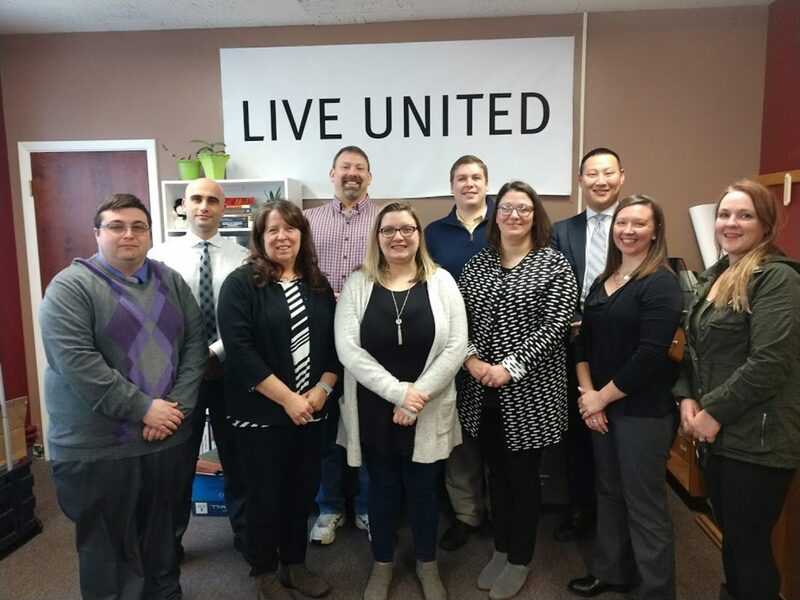 Although United Way of Northern Chautauqua County is part of the larger United Way network, it, as are all local United Ways, is controlled by a group of concerned citizens with a local focus. That group of volunteers helps to identify community needs, bring together stakeholders and problem solvers, and work to address the primary issues surrounding Health, Education and Financial stability for every person in our area. In addition to the President, the board’s executive committee is made up of a group of officers. Those officers are, Vice President Tyler Gotowka, Lawley Insurance; Treasurer Brad Balentine, Wal-Mart; and Secretary Lucas Catalano, SUNY Fredonia FSA. The remaining board members are Michael Borrello, Phillips Lytle; Paula Pichon, Seneca Nation; John Noel, Cassadaga Job Corps Academy; Jennifer Wilkins, SUNY Fredonia; Kim Wilkinson, Lakeside Clinic; Traci Avila, Cassadaga Schools; Beth Margolis, Liberty Winery, Alicia Ekstrom, The Chautauqua Center; Gary Sobilo, Nestle Purina; and Jonelle Frazier, Chautauqua Nursing and Rehabilitation. The annual meeting also saw the departure of long time United Way board member, Susan VandeVelde. VandeVelde served nine years on the board and served as the Vice President of Policy and Planning, as well as on numerous committees to support the United Way’s mission. She was thanked for her service and wished the best in her future endeavors. The United Way of Northern Chautauqua County’s mission is to empower our local community through education, financial stability and health. One in three of our neighbors have been impacted by local out-come based programming, funded by strategic investments of $4,119,150 since 1999. The United Way is located at 626 Central Ave., Dunkirk. Visit www.unitedwayncc.org or follow on Facebook, Twitter and Instagram.